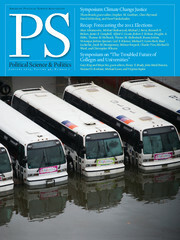 The latest issue of PS: Political Science & Politics (PS), published by Cambridge University Press, tackles threats facing the climate and the US higher education system, and recaps the accuracy of predictions for the 2012 presidential election published in the journal's final issue of 2012. Experts from across the political science spectrum have contributed to the debate on all three issues, making for a lively and thought-provoking issue of the journal published on behalf of the American Political Science Association (APSA) by Cambridge University Press. In the Election Forecast Recap, the journal follows up on its election prediction symposium of October 2012, concluding that it was a good year for most political science election forecasters. Of the 13 presidential election forecasts published in the October issue, eight were within two percentage points of the actual vote (51.9%) and four came within a single percentage point. While it is back to the drawing board for five of the models that had errors, PS concludes that the 2012 election forecasting experience should boost confidence in the models that were on target. Serving as guest editor for this symposium is James E. Campbell, University at Buffalo, SUNY. The thorny subject of achieving social justice in a changing climate is addressed by a second PS symposium. An issue of major international concern, climate change justice poses significant challenges in terms of social justice, equal rights, and human rights, along with the purely environmental challenges of a changing climate. The articles within this symposium provide new insights to illuminate the debate and offer tangible policy solutions and recommendations. Thom Brooks, Durham University, is guest editor of this symposium. The third symposium looks at the potentially troubled future of colleges and universities. Traditional colleges and universities are under attack by forces threatening to undermine their business model, governmental support, and operating mission. PS brings together seven distinguished scholar-administrators, each of whom has held leadership roles in major academic institutions, to discuss how political science might contribute to a coherent response. All agree that the ultimate aim is the preservation of US academia’s role in fostering the creation, preservation, and distribution of knowledge and, as a consequence, the spectacular progress across ﬁelds that American people have come to expect. This symposium in PS has been guest edited by Gary King from Harvard University and Maya Sen of University of Rochester. Gary King is the Albert J. Weatherhead III University Professor and the founding director of the Institute for Quantitative Social Science at Harvard University. King develops and applies empirical methods in many areas of political and social research, focusing on innovations that span the range from statistical theory to practical application. The statistical methods and software he has developed are used extensively in academia, government, consulting, and private industry. Maya Sen is an assistant professor in the department of political science at the University of Rochester. Her research interests include statistical methods, law, and race and ethnic politics, and she is currently examining the relationship between race and ethnicity and judicial decision-making in the federal courts. PS: Political Science & Politics is the journal of record for political science reporting on research, teaching, and professional development. PS, first published in 1968 by the American Political Science Association, is the only quarterly professional news and commentary journal in the field and is the prime source of information on political scientists' achievements and professional concerns. APSA, founded in 1903, is the leading professional organization for the study of political science and serves more than 15,000 members in more than 80 countries. With a range of programs and services, APSA brings together political scientists from all fields of inquiry, regions, and occupational endeavors within and outside academe, with the aim of expanding awareness and understanding of politics. Its extensive peer-reviewed publishing lists comprise 45,000 titles covering academic research, professional development, over 300 research journals, school-level education, English language teaching, and bible publishing.